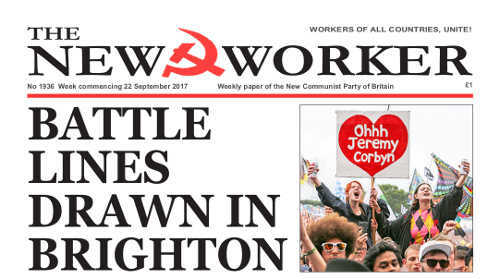 LABOUR conference begins this Sunday in Brighton — and is set for some crucial debates over proposed rule changes and issues such as Brexit. THE CONSERVATIVE Party is falling apart before our eyes. The team sent to Brussels to negotiate our exit from the European Union (EU) lost one of its key members, senior civil servant Oliver Robbins, who quit as head of the Department for Exiting the EU after just one year. No to Sanctions! No to War! Donald Trump took to the world stage at the United Nations this week with a 40 minute rant against Democratic Korea (DPRK), Iran and Venezuela that earned the applause of his most craven lackeys but embarrassed some of his European allies, who flinched at the vulgar abuse and moronic jokes that are the chief American warlord’s trade-mark these days. Read the full editorial here >> No to Sanctions! No to War!